These Copycat Waffle Love Liège Waffles are made from a rich, yeast-based brioche dough with Belgian pearl sugar kneaded into it to create a crunchy, caramelized sweetness around the individual pockets and ridges of each waffle. Top them with Biscoff cookie butter, a big scoop of freshly whipped cream, raspberries and sliced strawberries for an incredible dessert or a super decadent breakfast! Combine the milk, water, sugar and yeast in the bowl of a stand mixer and stir together. Let the yeast proof for 5 minutes without stirring. Add the eggs, honey, vanilla and salt and use the paddle attachment to beat everything together on medium speed until combined. Add the brown sugar and softened butter and beat again for with the paddle attachment for 1-2 minutes. The butter will not entirely combine with the other ingredients but don't worry just yet. Add in 1 cup of the flour and beat for 2 minutes with the paddle attachment until a smooth batter forms and the butter and flour have combined with the other ingredients. Add another 1 cup of flour and beat until it is incorporated, then switch to the dough hook and add the remaining 2 cups of flour. Knead the waffle dough until it comes together in a smooth ball on the dough hook and is no longer sticking to the sides of the bowl. Lift the dough from the bowl of the stand mixer and lightly grease the bowl, then return the dough to the bowl. Cover the bowl tightly with plastic wrap and let it sit on the counter at room temperature for about 3 hours to rise, until doubled in size. Punch down the dough (literally, just make a fist and stick it way down into the center of the dough), then cover it with plastic wrap again and stick it in the refrigerator for at least 6 hours but anywhere up to 14-16 is fine. Heat your waffle iron on it's lowest setting. While the iron is heating, knead the Belgian pearl sugar into the cold waffle dough. This will take some effort as the dough will be quite stiff but don't worry if it all the sugar doesn't seem to want to go into the dough. Just leave it in the bottom of the bowl and after dividing the dough into 10-12 individual portions, you can roll each portion in the remaining sugar to use it all up. Shape each portion of dough into a disc and set it on the hot waffle iron. Press the iron down and cook the waffle until golden brown. On my waffle iron, I can cook four waffle at a time and it takes about 4 minutes but you might need to adjust based on your particular waffle iron and heat setting. I do not recommend cooking these on the higher temperature settings of your waffle iron. 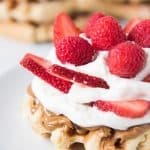 Remove waffles from the waffle iron and top with Biscoff spread, whipped cream and fruit (or whatever toppings you want) or keep warm in a 200 degree oven until ready to serve. In the clean bowl of your stand mixer, beat the heavy whipping cream on high speed with the whisk attachment, gradually adding the sugar and vanilla, until whipped cream forms. You want it more on the stiff side so it should be able to easily hold it's shape and support the weight of berries once it is scooped onto each waffle.